The Chancellor's Residence at the University of Pittsburgh is a Pittsburgh History and Landmarks Foundation Historic Landmark in Shadyside just east of the main Oakland campus approximately one half mile from the center of campus at the Cathedral of Learning and adjacent to the rear property of the University Child Development Center on the Oakland-Shadyside border in Pittsburgh, Pennsylvania. The residence is the former Harvey Childs house built by Mount Pleasant mansion. The structure overcomes what was at the time an architectural problem of including a porch that Pittsburghers wanted, but preventing the porch from obscuring the facade toward the street. The design of this house worked around this problem by placing the porch to the side of the house, balanced by a porte-cochere. A renovation designed by Landmark Design Associates later enclosed the porch at the Chancellor's Residence. Harvey Childs, the original owner for whom the residence is sometimes named, was one of the three Pittsburgh citizens that played a role in the origins of the Allegheny Observatory and thus the early years of University's Department of Astronomy and Physics. He also served as a trustee to the university, then called the Western University of Pennsylvania, from 1863 to 1876. 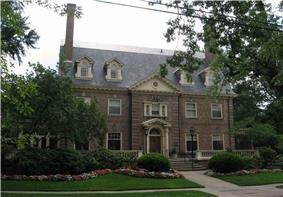 The residence was also the home of John F. Casey, a University of Pittsburgh Trustee until his death in 1948. The home was given to the university to serve as a residence for its chancellor in 1966 by Leon Falk, Jr. who served as vice chairman of the university's Board of Trustees. 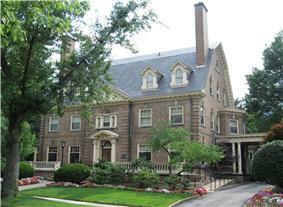 Pitt's previous chancellor's residence was on Morehead Heights in the Oakland neighborhood of Pittsburgh and was sold to the Catholic Institute of Pittsburgh proceeding Falk's gift. ^ "Internet Archive: Pittsburgh History and Landmarks Foundation: PHLF Plaques & Registries". 2007-01-27. Archived from the original on 2007-01-27. Retrieved 2008-07-25. ^ "John F. Casey, Trustee, Dies". The Alumni News Review (General Alumni Association of the University of Pittsburgh) 3 (2): 2. December 1948. Retrieved February 12, 2013. ^ a b "Leon Falk Gives His Home for Chancellor's Residence". Pitt (University of Pittsburgh) 22 (4): 19. Fall 1966. Retrieved February 12, 2013. Pitt J. Envtl Pub. Health L.